Hardcover with colour, pencil and pen and ink illustrations. 96 pages. 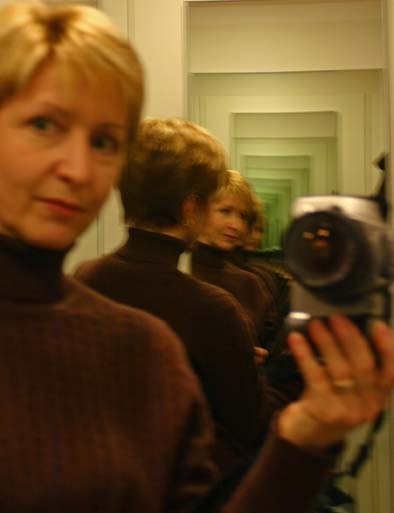 10" × 11¼"(25 cm × 29 cm). Last year I bought London Sketchbook: A City Observed (Sketchbook) with watercolour paintings by artist Graham Byfield and text by architecural writer and conservationist Marcus Binney. I'd previously acquired the Venice Sketchbook, in the same series, and had found it tremendously helpful when I was trying to locate different places worth drawing or painting prior to visiting Venice in 2005. 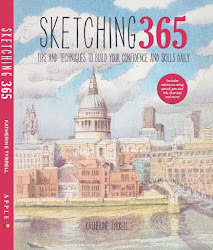 I was naturally intrigued to see what sort of places had been selected for sketching on my home turf - London. "When a man is tired of London he is tired of life......"
"Sir, if you wish to have a just notion of the magnitude of this city, you must not be satisfied with seeing its great streets and squares, but must survey the innumerable little lanes and courts. It is not in the showy evolutions of buildings, but in the multiplicity of human habitations which are crowded together, that the wonderful immensity of London consists." artists wanting to sketch, draw or paint London. The overall approach favoured by the book is to divide the book into sections based on areas - Central London, The City and East End, West London, North London and South of the River. Whole pages devoted to one view alternate with groupings of vignette sketches. 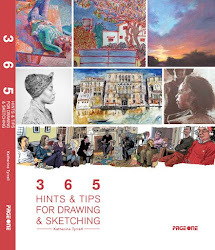 This approach enables 150 watercolour paintings and pencil drawings to be included on a total of 96 pages and provides a good sense of place - as well as identifying the opportunities for sketching in an area. Byfield's pencil drawings with watercolour added selectively are charming. He not only paints the large and better known buildings, he also focuses on less well known buildings and streets and some interesting architectural details. Each individual drawing/painting is also accompanied by a handwritten short commentary by Byfield on each individual painting. However, it's now some 6 years since the book was published and some of the sketches involving skyline are now a little dated. For example, Byfield's panoramic views of the City of London from the top of Greenwich Park were rather fine - but were obviously executed pre-Gherkin. Quite a lot of his subject matter is not easy to do quickly or without some reasonable grasp of perspective and architectural drawing. However, his vignettes of individual buildings and parts of buildings are well within the grasp of a lot of sketchers. Binney provides an excellent overview at the beginning of the development of this capital city and its heritage in terms of the different architectural styles found around London. He also introduces the chapter for each area and says something about the places, the architecture and the historical associations of the places featured. He identifies the contrasts and challenges of architectural development over time at the same time as highlighting the conservation triumphs - such as Covent Garden Market. His knowledge is such that even if you've seen a place many times, the chances are you'll learn something new. A more technical gazetteer at the end, again written by Binney, provides more detailed information about the age and background of each building. I was absolutely fascinated to find that I'd seen most of the buildings included in the book at one time or another (maybe I've lived here too long?!) - but I didn't know that the Imperial War Museum in Lambeth is housed in the former Bethlehem Mental Hospital or that Constable used to live in a house in Well Walk in Hampstead! 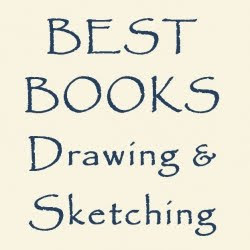 Overall, rather than being a facsimile sketchbook with sketches done on the spot presented in timeline order, this is book which has been is compiled from various different sketches done at different times. The sketches are then presented in such a way as to make an attractive book. Personally, I'd have liked to have seen at least a page devoted to equipment and approach to getting the sketches done. It did make me wonder just how many of the sketches were done 'plein air' and on the spot and how many were done from photographs. 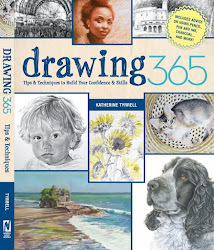 Further reviews of books of interest to sketchbook artists can be found in the right hand column. Graham Byfield is a forner graphic artist and creative director in advertising. He is now a full-time artist with his own gallery in Menorca, Spain. Marcus Binney OBE is the founder and president of Save Britain's Heritage, the Chairman of Save Europe's Heritage and the architectural correspondent at The Times; he received his OBE in 1983 and the London Conservation Medal in 1985. How very interesting to see you have reviewed this book. It's one of my favourites, the drawings are excellent and I love his light painting style but I had the same question as you - how did he do it? I think many must have been done from photos and if they weren't, I can't imagine why the publishers didn't see fit to ask him to write about his experiences. Had they been done in the field, he would have had so many interesting encounters and problems (weather, tourists, sitting in crowded streets etc.) and I'm sure they would have been worthy of inclusion. The sheer number of paintings he does must surely make it too time consuming to travel to these places and produce the paintings en plein air. I'm sounding cynical but I do wish there was more info about the making of his books, without it they tend towards 'coffee table' rather than travel. I also feel that these can give artist's an unrealistic view of what we can expect to achieve on our own (often short)travels. Thanks Felicity - my feelings exactly!